Earlier this year I wrote about congratulations received regarding the Bulldogs’ win and I called the article ‘I thought of you’. I expected the Bulldog’s story to continue to be the story leading up to the start of the 2017 competition and so it has. Major battles might have been won by the Dogs as they made their mark in history last year, but the war with seventeen other clubs continues. It’s only an armistice at the moment. A brief respite. We are experiencing the lull between club wars. After 62 years experience of being the hunters, the Bulldogs will now become the hunted. Bulldog supporters have been spoilt over summer with the women’s team and recently the senior men’s team playing matches at Whitten Oval. When the women play, the AFL premiership heroes are on the boundary barracking and signing autographs or being interviewed as part of the direct television coverage. President Peter Gordon is never far away, puffed up and beaming with pride, reflecting on how the Bulldog fans are back in force at Whitten Oval. It wasn’t always like this out in the west when we usually had to bunker down with fingers crossed, preparing for a new season. Since the optimism of season 1955 starting as reigning premiers, it has never been like this. We are still getting used to our football-heroes taking centre stage. Once it was Gary Ablett Junior and Senior or someone like Chris Judd who were the poster boys for the VFL and the AFL. Now it’s the Bont. Bulldog supporter groups have posted pictures of the Bont adorning the sides of trams. I also note that Marcus is on the front cover of one of the newspaper footy magazines. That glossy insert we all look forward to at this time of year because it’s the one where the experts tell us who will win the premiership. Early predictions indicate it will be GWS. Even after the Bulldogs had that historic win and with five or six A-grade players set to return, there are still the doubters. During this current cease-fire between clubs, reminders of what the premiership meant to the Bulldog faithful are everywhere. Even overseas. Luke Beveridge holidaying in New York at Christmas time rugged -up against the cold was spotted by a fan who cheekily yelled to him, “ Go Doggies!” Closer to home, my wife was meeting a friend at a cafe in Camperdown when Easton Wood’s mother came over to say hello. The conversation went straight to football, the Doggies and the Almanac. Easton’s mother said she had read the 2015 edition of the Almanac and enquired about getting a copy of the Doggies Almanac. My wife said I was a contributor to the book and had a spare copy at home that I’m sure he would be glad to send it to you. Would I ever and did I ever! Bulldog supporters are about to experience a completely new mind-set as we enter Season 2017. Confidence has replaced pessimism not only in the playing group after what they achieved last year, but confidence in the club itself. The million dollars plus in merchandise sales after the premiership will make a hole in any debts still owing and of course memberships and game attendance figures will increase dramatically. A far cry from relying on funding from the AFL each year to keep the club viable. It also coincides with the AFL now owning Etihad Stadium ensuring a better return for the tenants including the Western Bulldogs. Bulldog fans are now running out of things to feel downtrodden about which is the biggest cultural change for them heading into the new season. Back to my wartime analogies. 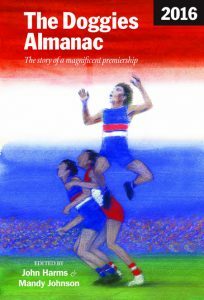 I was at the Whitten Oval the day after the grand final and that memory of being part of the Footscray celebrations with thousands of fans will live with me for ever. Photos and video footage of that Sunday have been repeated constantly to ensure I will never forget the day all the waiting and hoping for a premiership was finally over. Without being too dramatic, it reminded me of photos and film I have seen regarding the celebrations at the end of the Second World War. Masses of people gathering in the centre of Melbourne where strangers hugged each other and wept for joy. Seventeen teams from around Australia are training and preparing for an assault on the reigning premiers. Very recently it would have been the Bulldogs planning how to beat Hawthorn, Geelong and Brisbane who had all won multiple premierships and just making the final eight would have been an achievement. Not any more. Negativity has been replaced with optimism because of what we witnessed in September and early October 2016 on the football field. So let the battles recommence and put an end to the phony war that has dragged on far too long. Nice article. I can’t wait to see Crameri slide back into the bulldog’s forward line this year. I’m also eager to see how Cloke will go, still unsure if his style will suit the doggies. Neil, what a glorious time the aftermath of your team winning the flag is! Reckon the Bulldogs will be hard to top again this year, especially with some players coming back who missed out on the premiership who will be hungry for success. I’m also looking forward to seeing Crameri and Cloke in action plus the returning injured stars. They were all a bit rusty against the Lions but had less than half the regular team playing. I like the way Bevo is managing the star-players before Round 1 even though we still can’t take a trick with injuries before the season starts. What a great role-model Easton is Luke. I was really sorry to miss that meeting with his mother when Sharyn ( Mrs A to you ) was speaking to her in that café in Camperdown. Sharyn used to teach with Easton’s father at Cobden Tech. Well written Neil. I was shattered to see poor Roark Smith go down on Thursday night and hope we don’t have the horror year (injury-wise) we had last year. However, the same end result would be brilliant. It seems we are playing the pre-season very cautiously and it is interesting to hear that most teams are now copying our run from the half-back line approach. However, our intensity around the ball is what really won us a lot of games. We will definitely be the hunted this year. Interesting that GWS have been installed flag favourites. Being the underdog suits us. I’m confident we will be up there again this year but we have to win more games (coming from 7th was unprecedented and won’t cut it a second time). I await the season nervously but with great anticipation. Yes, it was horrible to see Roark go down. Reminded me of Libba and Murph so early in the season and of coarse the other Smith, Clay. There is only so much resolve and showing ‘the guts and determination’ as the most famous Bulldog once said, before it weakens the team. You’re right, we don’t want to be coming from seventh again this year. And yes, I’ve noted many other teams are practising the Bulldog’s style of play. Particularly the quick handball out of trouble.